Use a force gauge to measure the maximum force (pushing or pulling) needed in the task. This is the measured force. The maximum force is usually the starting force, but may be the uphill force for tasks on a slope. Record the height of the hands (where the worker's hands would normally be on the handle). Enter the data in the fields below. Click Submit. A window will open with the guideline results. Error: Please select the action being performed. 1 hand = Person uses only 1 hand when pulling. 2 hands = Person uses 2 hands when pushing/pulling. Error: Please select the type of exertion. Straight = Push or pull along a straight path. 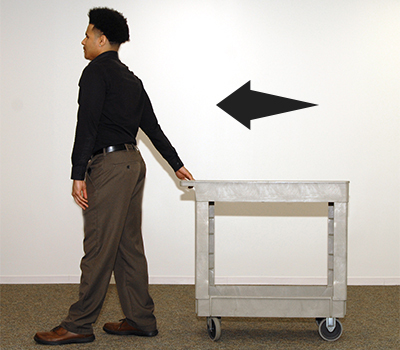 Turning = Push or pull along a curved path (Example: going around a corner). If path has both straight and curved sections, select Turning for the type of exertion. Error: Please provide a valid measured force. 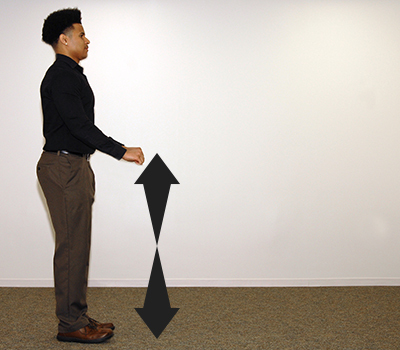 Handle distance (inches, with hand on handle) These guidelines were developed assuming the hands are placed approximately shoulder width apart when turning. Please note that they may not be applicable for significantly wider or narrower hand distances. Error: Please provide a valid handle distance. 32" 33" 34" 35" 36" 37" 38" 39" 40" 41" 42" 43" 44" 45" 46" 47" 48"
Error: Please select the hand height. Measured from the floor to height of worker's hand (knuckles) on the handle. According to the guideline, your task is safe for at least 80% of the population. According to the guideline, your task is safe for 50-80% of the population. It is suggested that you make changes to the task to make it safer for more people. According to the guideline, your task is safe for <50% of the population. It is strongly recommended that you make changes to the task to make it safer for more people. *Guidelines developed by The Ohio State University with a research grant from BWC.